CANEGROWERS believes that Queensland's cane farmers are doing remarkable things when it comes to protecting and caring for their environment and the Great Barrier Reef. For many years our members have been involved in an amazing array of projects and trials, and designed and implemented innovative and creative solutions, to improve productivity and profitability and reduce the impact of farming on the environment. This is a snapshot of some of our growers and their stories from the past few years. We acknowledge the efforts and commitment of all Queensland cane farmers who have proudly taken on the role of environmental stewards for many decades and will continue to do so long into the future. Aaron Linton has used Reef Programme funding to trial a new drip irrigation system against traditional furrow irrigation. Watch more. Allen Birt, who leases his farm from MSF Sugar, says the company's investment in low-pressure overhead irrigation systems will deliver benefits for all. Watch more. Angle Mustafa has taken advantage of Reef Programme funding with three initiatives in operation on his farm, each directly tied to reducing nutrient, pesticide and sediment run-off into the Great Barrier Reef lagoon. Watch more. Ashley Petersen has spent 20 years trialling different farming systems and adopting many of the industry's evolving best practices in order to improve the quality of his soil. Read more. Bevan Manderson has reduced water use and electricity costs on his farm thanks to more accurate flow-rate data and a new overhead centre pivot system funded in part under the Reef Programme. Watch more. Brian Dore is one of a group of Tully growers who participated in a trial of new satellite technology to address crop yield variations within blocks, with the ultimate aim to improve the quality of water flowing into the Great Barrier Reef. Read more. Chris Russo secured funding under the Reef Programme to trial a split fertiliser application strategy on his farm, which has the potential to change the way cane growers across the industry fertilise their crops. Read more. Drew Watson is one of many Wet Tropics cane growers reaping the benefits from one-on-one nutrient planning sessions funded by the Reef Trust III program. Read more. Gary Raiteri is using soil probes and weather stations to ensure he irrigates his crops only when needed for maximum growth, while changes to his irrigation machinery and practices has resulted in less water and electricity costs, reduced run-off and increased productivity. Watch more. Gary Spotswood and wife Angela took out the Reef Conservation Award in 2017 for their work in restoring the ecological function of a coastal wetland on their property. Read more. Gerry Deguara and his sons are employing a range of farming methods helping to boost productivity and deliver environmental benefits for the Great Barrier Reef, including implementing a fallow program as a way of aiding soil health and putting nitrogen back into the ground 'nature's way'. Watch more. Greig Zunker and his father Graham have made the switch to a low-pressure lateral overhead irrigation system in a bid to reduce energy consumption and increase crop irrigation efficiencies. Watch more. Jeff Atkinson says moving his farm to a fully-controlled traffic system was the best on-farm decision he's ever made. Read more. Joe Linton is one of nearly 60 farmers hosting a trial of enhanced efficiency fertilisers on his farm, in a bid to identify the conditions under which EEFs can increase grower profitability while reducing any fertiliser losses to the environment. Read more. Joe Marano says using SIX EASY STEPS has helped him to develop unique nutrient management plans for the different soil types on his farm, helping to save him money and reduce fertiliser run-off into the surrounding environment. Watch more. Joe Zappala welcomed Reef Programme funding which helped him to purchase a purpose-designed stool splitter and fertiliser box and keep pace with environmental best practice in applying sub-surface nutrients to his crops. Watch more. Layton Mitchell has had to employ a wide range of water management systems on his farm to deal with diverse weather patterns including cyclones and drought. Read more. Lindsay Travers is one of several Cairns region growers who signed up to trial a unique variable rate fertiliser applicator that has the potential to dramatically reduce inorganic nitrogen use on cane farms. Read more. Mario Raccanello has responded to the challenge of protecting the Great Barrier Reef by trialling bio-fertiliser on his farm in an effort to reduce nitrogen run-off. Read more. Mark Castelanelli has reduced the amount of nitrogen applied to his entire farm after participating in an Enhanced Efficiency Fertiliser trial which showed no difference in his crop's productivity. Read more. Mark Hatch took part in a pilot project in the Burdekin using conjunctive use bores to combat rising groundwater levels in the region. Watch more. Paul Gregory says his decision to convert his farm to a GPS-mapped controlled traffic system was based on improving productivity and profitability, as well as the associated environmental benefits to his farm and the surrounding landscape. Read more. Paul Mizzi has designed a prototype zonal ripper to reach soil more than 1-metre beneath the surface to break through compacted soil and reduce water and fertiliser run-off. Read more. Paul Schembri (CANEGROWERS Chairman) is leading by example having achieved Smartcane BMP accreditation in 2016. He has challenged cane growers to undertake the process themselves and get the message out about the good work being done to protect the Great Barrier Reef. Read more. Peter Greensill, together with brothers Lex and Andrew, co-own the Greensill Farming Group which has installed a high efficiency furrow irrigation system, focused on reticulation, reduction of chemical and nutrient run-off and overall water efficiency. Read more. Ray Vicarioli has implemented a range of techniques to deal with an oversupply of water on his farm, including a sophisticated sub-surface drainage system to minimise run-off and maximise the storage of nutrients in soil. Read more. Ray Zamora has a passion for improving soil health and is now reaping the benefits. He has embraced modern farming practices including moving his entire farm to zonal tillage and brewing his own compost tea. Read more. 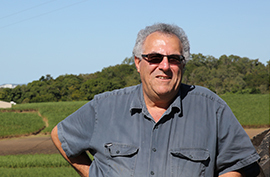 Tony Bugeja is reaping the benefits of using GPS technology and zonal tillage on his farm. Watch more.